This cheesy vegetarian overnight breakfast casserole is an easy vegetarian breakfast option to serve overnight guests on busy holiday mornings. My husband and I may not be vegetarians ourselves, but we have friends and family that are. When we have guests, we try and accommodate all of their diets. We don't want anyone to not be able to enjoy the food that we serve. That is why we believe that it is important to have vegetarian options to offer our guests, especially during the holidays. 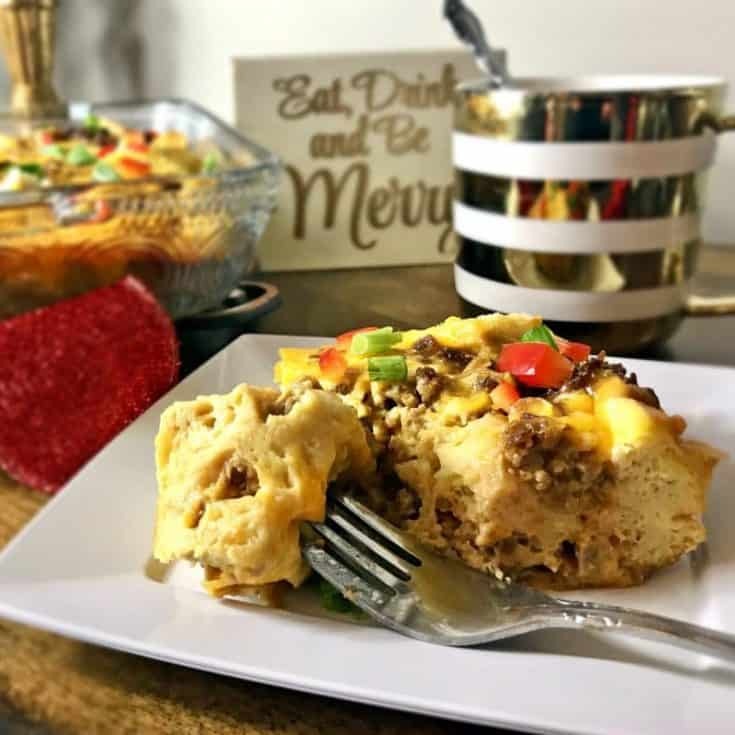 This cheesy vegetarian overnight breakfast casserole is perfect for serving Thanksgiving morning, Christmas morning, New Year's day, or anytime over the holidays that you are hosting overnight guests. 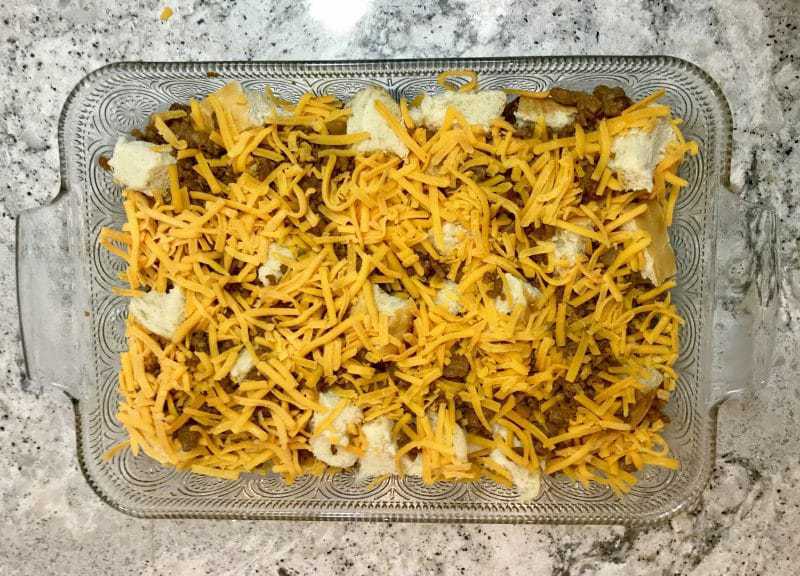 The casserole is quick and easy to prepare, and perfect for feeding a crowd. The best part about this delicious recipe is that it can be enjoyed not only by vegetarians, but by everyone. 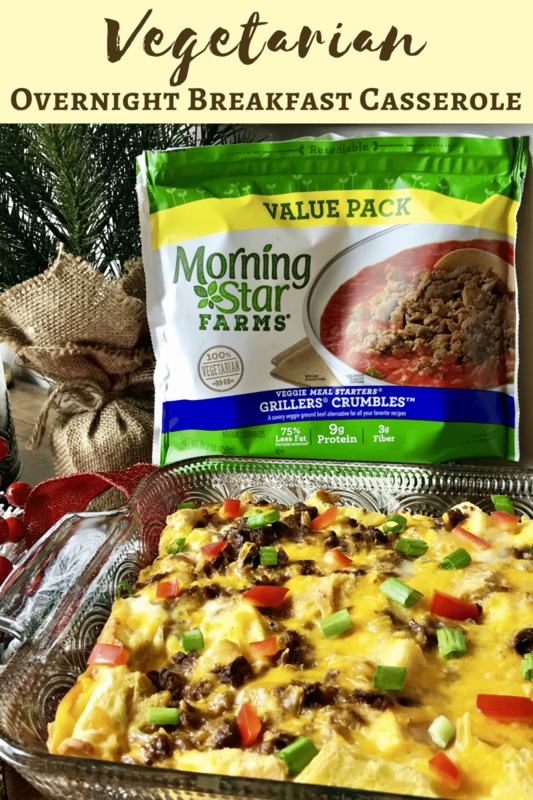 MorningStar Farms® Grillers® Crumbles™ are the perfect addition to this recipe, giving it a great flavor that everyone is sure to love. 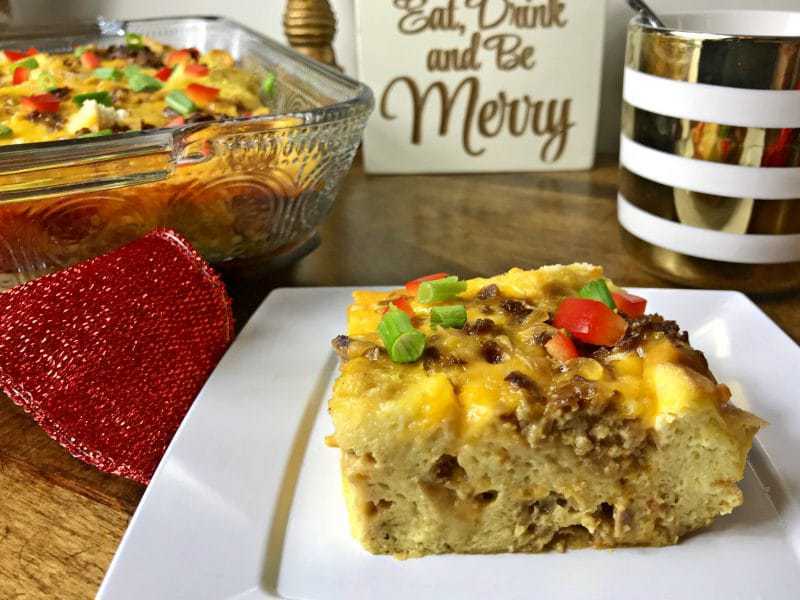 This vegetarian breakfast casserole can be prepared the night before, then refrigerated overnight. In the morning it just needs to be baked for about an hour and then it is ready to serve. It truly is the perfect breakfast to serve overnight guests on busy holiday mornings. 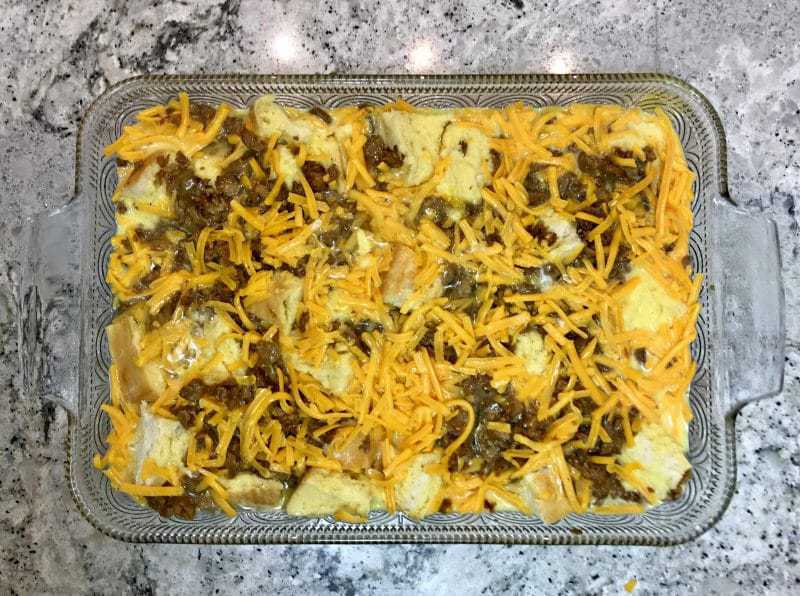 I like to pop the breakfast casserole in the oven as soon as I wake up, and then go ahead and get ready for my day. The casserole is ready to serve by the time the rest of the house is up and ready for breakfast. 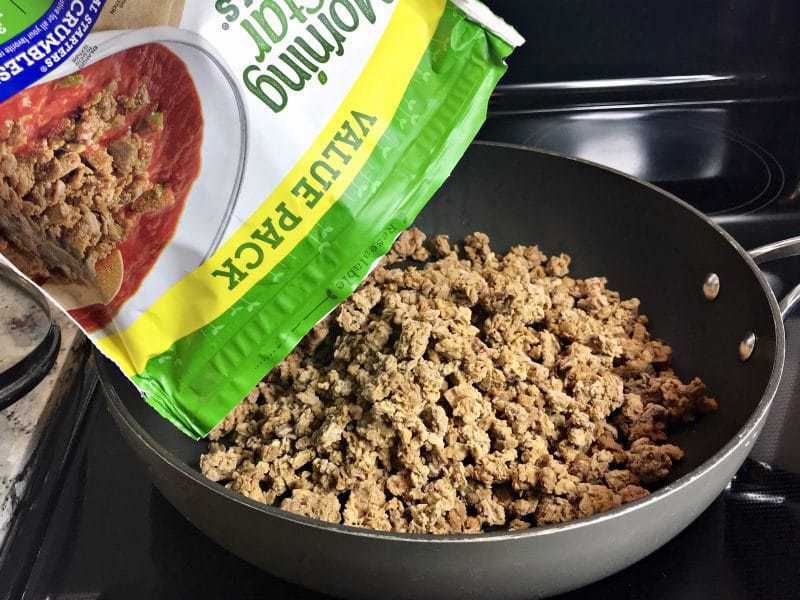 Prepare MorningStar Farms Grillers Crumbles in skillet according to package instructions. Grease a 9 x 13 inch baking dish and get ready to layer. First, spread half of the bread evenly in the bottom of the baking dish. Next, add half of the Grillers Crumbles. Finally, sprinkle with half of the cheese. Then repeat the layers once more: bread, Grillers Crumbles, cheese. In a large bowl, whisk together eggs, milk, salt, and pepper. Pour the mixture over the top of the casserole. In the morning, cook at 325 degree for about 50-60 minutes, until the eggs are set and the cheese is bubbly. Garnish with green onions and red pepper, if desired. 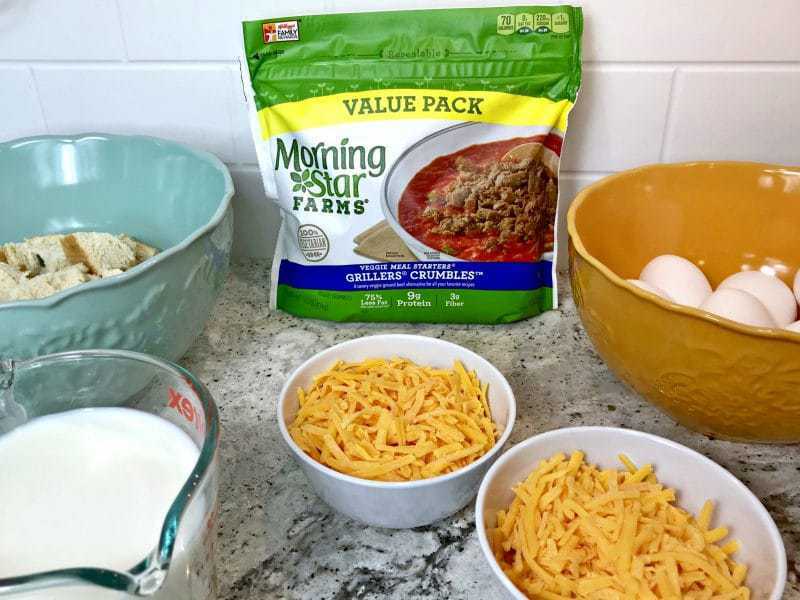 The MorningStar Farms Grillers Crumbles are the star of this delicious recipe. 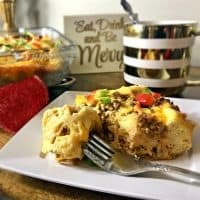 They give the casserole that meaty flavor everyone loves, while keeping the dish an option for everyone, including vegetarians. You really need to taste it to believe it! Plus, Grillers Crumbles make a healthier addition to this dish than would adding meat. 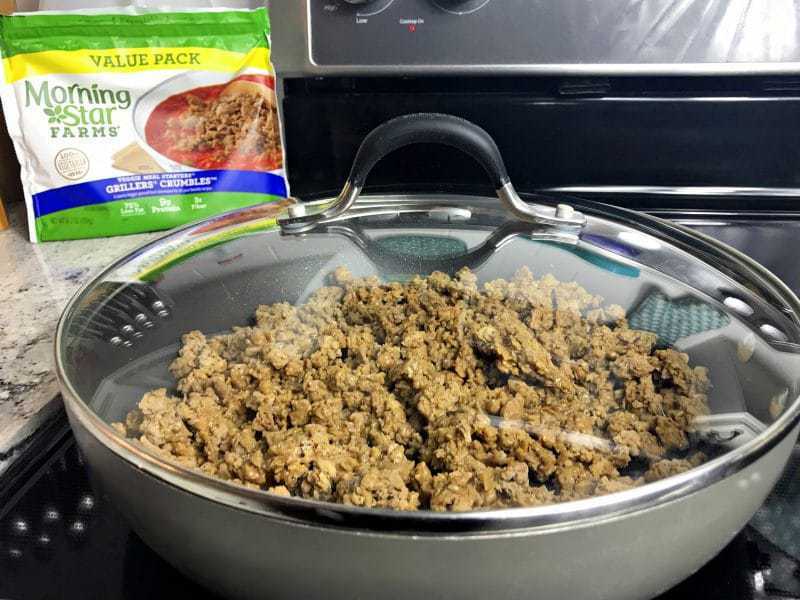 They contain 75% less fat than regular ground beef, while still packing 9 grams of protein per serving. 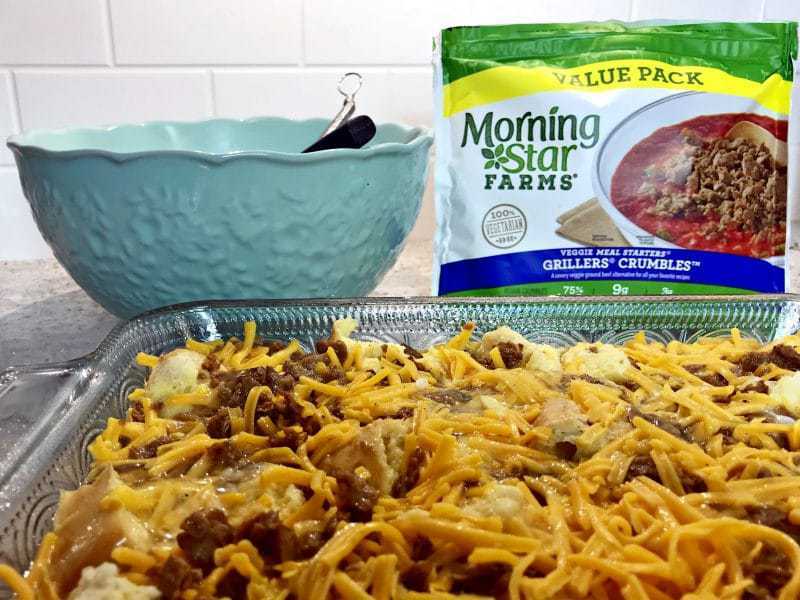 In addition to being great in this breakfast casserole, Grillers Crumbles are perfect for making vegetarian sloppy joes, vegetarian pasta sauce, vegetarian meatloaf, and so many other awesome recipes. 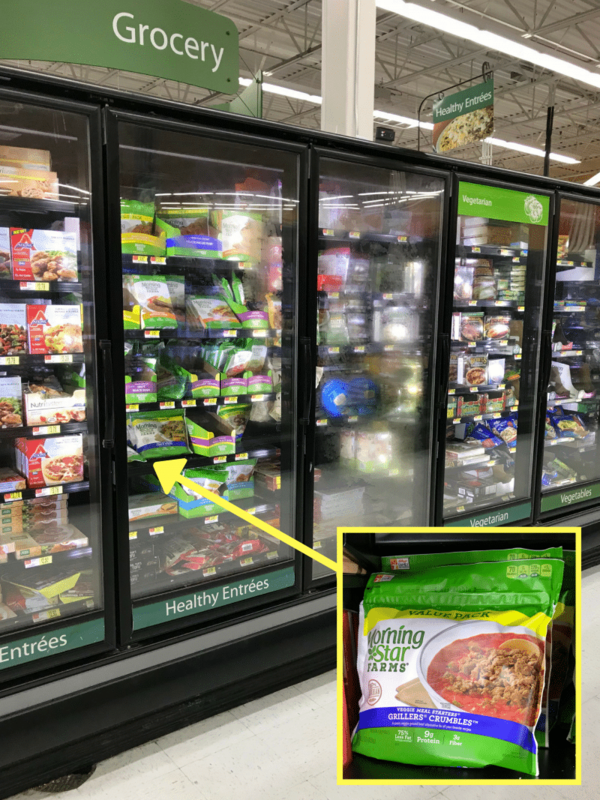 You can find MorningStar Farms Grillers Crumbles in the Frozen Foods section at Walmart. 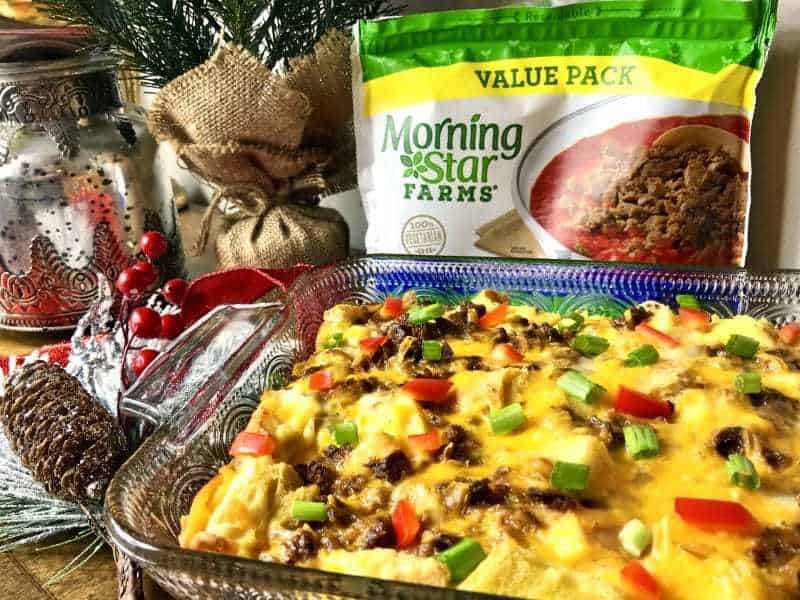 For more tasty recipe inspiration, be sure to check out the MorningStar Farms recipe hub. Grease 9 x 13 inch baking dish. First, spread half of the bread evenly in the bottom of the baking dish. Next, add half of the Grillers Crumbles. Finally, sprinkle with half of the cheese. Then repeat the layers once more: bread, Grillers Crumbles, cheese. In a large bowl, whisk together eggs, milk, salt, and pepper. Pour over the top of the casserole. Yummo!! This sounds amazing!! I haven’t tried this sausage yet from MorningStar farms but it sure looks JUST like the real thing!! The casserole sounds seriously delish! 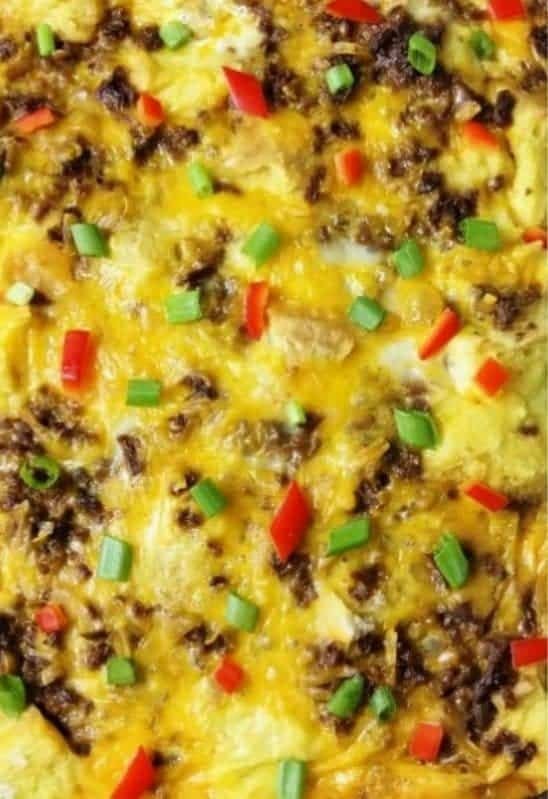 This breakfast casserole looks delicious and I love that it’s easy to make. Perfect for the busy holiday season!